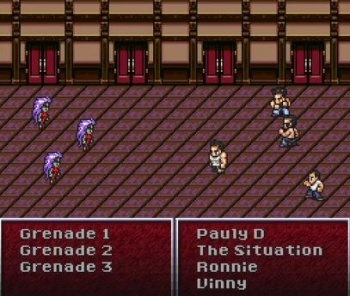 Jersey Shore has combined itself with Final Fantasy to create the ultimate fist-pumping RPG. The fine folks at College Humor may have created the greatest RPG ever, or at least the one with the most abs and hair gel. They've turned addictive MTV train wreck Jersey Shore into a classic RPG with the style of the 16-bit Final Fantasy titles from the Super Nintendo era. If any humorous video needed to become a real videogame, it'd be this, and I wouldn't be surprised if it actually does. The boys... sorry, "boyz" of Jersey Shore start off with a hot tub that sadly has no "skanks" in it, and that simply won't do. They set off on an epic quest to a "popping" club where they hope to find some nice ladies to start wholesome relationships with. In the search for these women, the fellows encounter a group of "grenades" and are forced to save Ronnie from engaging with them due to his drunken stupor with special moves like Pauly's DJ scratching. Grenades aren't this game's only horrors, as "disrespecting clowns" are also enemies of the Jersey Shore house that must be eliminated on a regular basis. When fist-pumping isn't good enough to eliminate your foes, only one possibility remains: gym, tanning, and laundry! These three daily activities that keep any shore inhabitant looking fresh are sure to intimidate anyone trying to act like they know. At the end of the day, the stars of Jersey Shore always have a hot tub filled to the brim with women and men of questionable morals, and the game's ending accurately reflects that. Sorry for the spoiler. I would so play a real game like this, and then hate myself afterward, just like anybody that watches the actual television show.